All Web addresses mentioned were functional as of 9-4-15. From the Cumberland Gap to the Atlantic Ocean, this is Virginia Water Radio for the week of September 7, 2015. That underwater sound from a Chesapeake Bay tributary sets the stage for our second episode on the importance of the Eastern Oyster—this week, on the oyster’s role in the Bay’s nitrogen cycle. To start, have a listen for about 15 seconds to these mystery sounds, and see if you can guess what particle-removing process the famous Bay bivalve uses to make its living. And here’s a hint: without this process, coffee’s grounded and car oil’s gunky. If you guessed filtering, you’re right! You heard muddy water being pumped and filtered in a water-chemistry lab. Lab equipment, coffee-makers, cars, and other machines use filters to separate solid particles from liquids. And so do oysters, which pump water over gills to filter out floating algae. By consuming algae, oysters also consume the nitrogen that the algae previously absorbed from the water. Nitrogen’s a component in many biological molecules, and excess nitrogen can stimulate an excess of algae. Too much algae can result eventually in low dissolved oxygen levels and shading out of ecologically important underwater plants. Oysters’ filter-feeding on algae is one reason why these shellfish are a focus of efforts to restore the Chesapeake Bay ecosystem. Of particular interest currently are oysters raised in aquaculture operations, and just how much nitrogen those oysters can remove from Bay waters. Oysters use some of the nitrogen they consume to build shell and tissue, but much of the nitrogen gets excreted or deposited onto bottom sediments. Measuring the fate of nitrogen in those sediments is the challenge being undertaken by various scientists, including University of Virginia master’s student Abby Lunstrum, one of four students receiving research grants in 2014 from the Virginia Water Resources Research Center. Ms. Lunstrum’s work, based on sampling at an oyster farm in Northampton County, Va., seeks to quantify how much sediment nitrogen gets buried, how much gets converted back to forms that algae can absorb, and how much gets converted into nitrogen gas and returns to the atmosphere. Putting those nitrogen-cycle pieces together is necessary for determining what role oyster aquaculture may play in the nitrogen-reduction goals of the Chesapeake Bay TMDL, the pollution-reduction plan published by the U.S. EPA in 2010. In that context, Ms. Lunstrum’s work is part of another kind of filtering process: filtering scientific observations into repeatable measurements, practical technologies, and effective public policies. Just right for the Chesapeake’s most legendary filter-feeder. We close our two-episode oyster encounter with part of “The Oystermen's Ball,” by Bob Michel. "The Oystermen’s Ball," from the 2004 album of the same name, is copyright by Bob Michel, used with permission. This music was featured in Episode 279 (8-24-15), “Oysters, Nitrogen, and the Chesapeake Bay – Part 1.” This song was inspired by the oysters of Delaware Bay, where—as in the Chesapeake Bay—oysters and their filter-feeding remain a focal point for human and aquatic communities. More information on Mr. Michel's music is available online at http://www.bobmichel.com/. 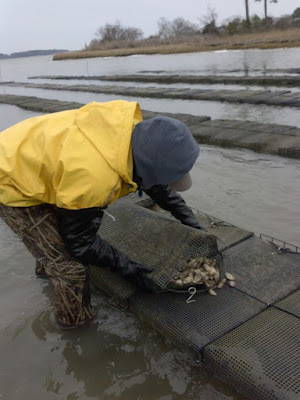 Abby Lunstrum’s research on nitrogen processing by oysters was supported in part by a grant in 2014 from the Virginia Water Resources Research Center. Ms. Lunstrum’s grant is one of four grants for 2014-15 (awarded in 2014) under the Water Center’s “Competitive Grants Program” to assist student research projects. More information on the program is available online at http://www.vwrrc.vt.edu/grant-opportunities/competitive-grants/. Future Water Radio episodes will focus on other student research projects supported by this Water Center grant program. Scenes in summer 2014 from Ruby Salts Oyster Farm in Northampton County, Va., the site of University of Virginia student Abby Lunstrum's field work on nitrogen processing by aquacultured oysters. Photos courtesy of Abby Lunstrum. Oyster aquaculture has been practiced in Asia for centuries and since the 1800s in parts of the United States. In the Chesapeake Bay region, aquaculture has traditionally meant adding oyster shells to natural oyster beds in order to provide more attachment points for wild-produced oyster larvae. But newer developments include use of hatchery-raised oyster larvae and of various kinds of constructed floats or cages to house developing oysters. According to the Virginia Institute of Marine Science, Virginia’s number of “aquacultured market oysters” sold increased from fewer than 1 million in 2003 to 39.8 million in 2014. Nitrogen and phosphorus are two key nutrients in photosynthesis and growth of plants and algae. Many bodies of water, however, including the Chesapeake Bay, Gulf of Mexico, and other estuaries, receive more nutrients—particularly nitrogen—that is healthy for ecological balance in those ecosystems. While most of the atmosphere consists of gaseous nitrogen, that form of nitrogen is not usable by plants and algae. It must first be converted into “reactive” nitrogen compounds—nitrate, ammonia, and ammonium. Reactive nitrogen forms reach water bodies like the Chesapeake in runoff from streams, through the air, and by nitrogen-fixation (the conversion of atmospheric nitrogen into reactive forms) by certain bacteria. Human activities that lead to excessive reactive nitrogen in U.S. estuaries are fossil fuel combustion, fertilizer use, and waste production by humans and livestock. Too much algae in the Chesapeake or other aquatic systems leads to two big problems: shading out ecologically important submerged aquatic plants; and reduced levels of dissolved oxygen, both at night when algae use more oxygen that they produce through photosynthesis, and after the algae die, when bacteria use oxygen while decomposing the algae. Oysters are only one or many coastal organisms—animals and plants—whose collective activities to remove suspended or dissolved materials from water have been called the “coastal filter.” That term typically refers to the capacity of coastal plants to absorb nitrogen or other plant nutrients, and retain those materials in their tissues for some period of time, reducing the impact of such materials on coastal and ocean waters. But the coastal areas capacity to filter out materials arriving in watershed tributaries also includes oysters and other animals—such as clams, mussels, and some fish—that feed on algae which (like aquatic plants) absorb nitrogen and other nutrients from the water. The audio referred to some sediment nitrogen in oyster areas being converted back to nitrogen gas and returning to the atmosphere. That part of the nitrogen cycle, accomplished by bacteria, is called denitrification. Denitrification represents removal of nitrogen from an aquatic system, so it’s a main focus of Abby Lunstrum’s research on the fate of nitrogen in oyster aquaculture operations. Denitrification is also of interest to scientists studying the nitrogen cycle in other aquatic areas, too. For example, the associate director of the Virginia Water Resources Research Center, Dr. Kevin McGuire, is part of collaborative research efforts in at the Hubbard Brook Long Term Ecological Research site in New Hampshire to measure the amount of denitrification in small forested streams, part of the tributary network whose waters eventually feed coastal estuaries like the Chesapeake Bay. For more on that work, please see Virginia Tech College of Natural Resources and Environment, “Patches of groundwater responsible for nitrogen loss from forests,” CNRE News, Summer 2015, Virginia Tech, Blacksburg, Va., available online (as PDF) at http://cnre.vt.edu/magazine/toc/201508/index.html. Chesapeake Bay Program, “Eastern Oyster,” online at http://www.chesapeakebay.net/fieldguide/critter/eastern_oyster. C. T. Driscoll, et al., Nitrogen Pollution: From the Sources to the Sea, Science Links Publication Vol. 1/No. 2 , Hubbard Brook Research Foundation, Hanover, N.H., 2003. Encyclopedia Britannica, “Nitrogen-fixing Bacteria,” online at http://www.britannica.com/science/nitrogen-fixing-bacteria. Rona Kobell, “Oyster aquaculture in MD, VA hit some snags in 2014,” Bay Journal, 11/6/14, online at http://www.bayjournal.com/article/oyster_aquaculture_in_md_va_hit_some_snags_in_2014. Alice Jane Lippson and Robert L. Lippson, Life in the Chesapeake Bay, Johns Hopkins University Press, Baltimore, 2006. Abby Lunstrum, “Nitrogen Cycling in Oyster Aquaculture,” online at http://www.abbylunstrum.com/research.html. University of Maryland Extension, “Oyster Aquaculture and Education Program, online at https://extension.umd.edu/aquaculture/oysters. Maryland Sea Grant, “Oysters,” online at http://www.mdsg.umd.edu/topics/oysters/oysters (page has links to several key publications and other information sources); “Oyster Aquaculture and Restoration,” online at http://www.mdsg.umd.edu/topics/oysters/oyster-aquaculture-and-restoration. Clyde L. McKenzie, Jr., “History of Oystering in the United States and Canada, Featuring the Eight Greatest Oyster Estuaries,” Marine Fisheries Review, Vol. 58, No. 4, 1996, available online at http://spo.nwr.noaa.gov/mfr584/mfr5841.pdf. Karen J. McGlathery, Kristina Sundbäck, and Iris C. Anderson, “Eutrophication in shallow coastal bays and lagoons: the role of plants in the coastal filter,” Marine Ecology Progress Series, Vol. 348, pp. 1-18, 2007; available online (as PDF) at http://www.faculty.virginia.edu/mcglathery/McG_Lab/Publications_files/McGlathery%20et%20al_MEPS07_Eutrophication_Lagoons_Review.pdf. NOAA/National Sea Grant College Program/Virginia Sea Grant/Maryland Sea Grant, “Oyster Research and Restoration in U.S. Coastal Waters: Research Priorities and Strategies,” 2004, Publication VSG-04-01, available online (as PDF) at http://www.mdsg.umd.edu/sites/default/files/files/store/oysterrestoration_summary.pdf. National Oceanic and Atmospheric Administration (NOAA), “Oyster Denitrification Research Overview,” online at [have printout], online at http://www.chesapeakebay.noaa.gov/habitats-hot-topics/oyster-denitrification-research-overview. Roger I. E. Newell and Roger Mann, “Shellfish Aquaculture: Ecosystem Effects, Benthic-Pelagic Coupling and Potential for Nutrient Trading” (report prepared for the Virginia secretary of natural resources), June 21, 2012, available online from the Chesapeake Bay Program at http://www.chesapeakebay.net/channel_files/18087/attachment_v_-_oyster_aquaculture_report_2.pdf. Robert R. Stickney, Estuarine Ecology of the Southeastern United States and Gulf of Mexico, Texas A&M University Press, College Station, Tex., 1984. U.S. Environmental Protection Agency (EPA), “Accounting for the Benefits of Filter Feeder Restoration Technical Documentation—Strategies for Allocating Filter Feeder Nutrient Assimilation into the Chesapeake Bay TMDL,” Appendix U of the Chesapeake Bay Total Maximum Daily Load (TMDL), December 2010, available online (as PDF) as http://www.epa.gov/reg3wapd/pdf/pdf_chesbay/FinalBayTMDL/AppendixUFilterFeeders_final.pdf. Neil M. Dubrovsky, et al., “Nutrients in the Nation's Streams and Groundwater 1992-2004,” U.S. Geological Survey Circular 1350, Reston, Va., 2010, online at http://water.usgs.gov/nawqa/nutrients/pubs/circ1350/. Virginia Institute of Marine Science (VIMS), “Oysters @ VIMS,” online at http://www.vims.edu/research/topics/oysters/; and “Virginia Shellfish Aquaculture—Situation and Outlook Report (Results of 2014 Virginia Shellfish Aquaculture Crop Reporting Survey)” VSG-15-01/VIMS Marine Resource Report No. 2015-3, March 2015; online at http://www.vims.edu/research/units/centerspartners/map/aquaculture/index.php. Industry Today,” 2001, online (as PDF) at http://mrc.virginia.gov/VIRGINIAS_OYSTER_MANAGEMENT_AND%20_INDUSTRY_TODAY.pdf. Don Webster, University of Maryland, “Oyster Aquaculture Production,” November 2007, online (as PDF), at https://extension.umd.edu/sites/default/files/_docs/programs/aquaculture/2_Production%20Methods.pdf. John Page Williams, Jr., Chesapeake Almanac, Tidewater Publishers, Centreville, Md., 1993. Artisans Center of Virginia, “Virginia Oyster Trail,” online at http://www.virginiaoystertrail.com/. Nigel Moore, “The Oyster’s My World—History of Oysters and Oyster Cultivation,” online at http://theoystersmyworld.com/. “Oyster Noises,” 10/16/13 post (http://theoystersmyworld.com/2013/10/16/oyster-noises/) lists many songs with an oyster theme. National Oceanic and Atmospheric Administration (NOAA)/National Estuarine Research Reserve System, “Estuary Education,” online at http://estuaries.noaa.gov/Default.aspx. NOAA/National Marine Fisheries Service, “Status Review of the Eastern Oyster (Crassostrea virginica), Report to the National Marine Fisheries Service,” February 16, 2007, online (as PDF) as http://www.nmfs.noaa.gov/pr/species/Status%20Reviews/eastern_oyster_sr_2007.pdf. Partnership for the Delaware Estuary, “Delaware Bay Oysters,” online at http://delawareestuary.org/oysters. Patricia Samford, Jefferson Patterson Park and Museum/Maryland State Museum of Archeology, “Oyster Wars,” 7/9/13, online at https://jeffersonpatterson.wordpress.com/2013/07/09/oyster-wars/. Smithsonian Marine Station at Fort Pierce, “Crassostrea virginica/Eastern Oyster,” online at http://www.sms.si.edu/irlspec/Crassostrea_virginica.htm. World Oyster Society, online at http://www.worldoyster.org/index_e.html. Listed below are some other episodes on subjects related to the Chesapeake Bay. Virginia Water Radio episodes are listed by category at the Index tab above (http://www.virginiawaterradio.org/p/index.html). 3.10 - impacts on survival of species. ES.3 – characteristics of Earth and the solar system (including sun-Earth-moon relationships, tides, and history of space exploration). PH.3 – nature and practice of science. VS.2 – physical geography of native peoples, including how American Indians related to their environment to secure food, clothing, and shelter. VS.4 – life in the Virginia colony. USI.5 – factors that shaped colonial America. WG.2 - how humans influence the environment and are influenced by it. GOVT.16 – role of government in Va. and U.S. economies, including examining environmental issues and property rights.